Who are you? You might be anyone. But the important question is who is the pony who asked Spike to write an anonymous love confession to you? In Somepony Has a Crush On You, you never play the same game twice. Each time you start the game, the answer to this mystery is completely random. One day it might be Apple Jack, another it might be Fluttershy. By playing it more than once, a player might expect to be able to predict who the secret crush is based on the clues leading up to the revelation, but hold on! The opening and middle side stories are also completely randomized. 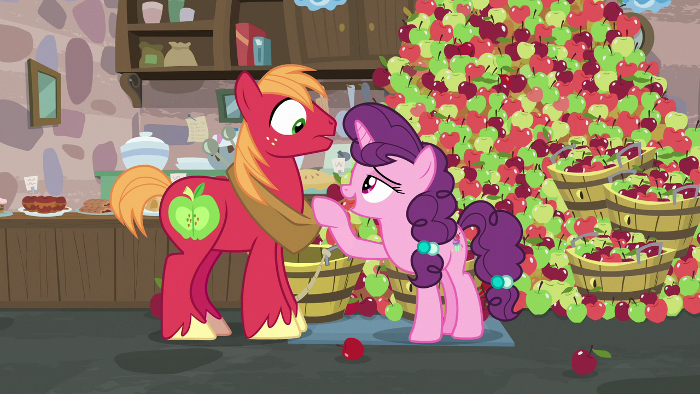 Rarity’s story might reveal Twilight Sparkle as your secret crush during one session, but the next time you draw Twilight as your secret crush, you might find out through Pinkie Pie with Rarity having no idea. The game/interactive novel works from a set of randomizers, programmed in Twine under the SugarCube format. The engine rolls the dice to decide which pony will be your secret crush at the end of each story. The engine rolls again to decide which ponies know something they can tell you, but disqualifying code guarantees that the ponies that give you the clues can not be the same as your secret crush. In order to find out the identity of your secret crush, you must talk to each of the ponies in Ponyville. This adventure is by no means linear. In your quest to find your secret crush, you’ll be drawn into the lives and problems of the other ponies around Ponyville. The finished product will include a better-looking interface, black text on a white background and an occasional screen capture from the show which fits the scene. The first secret pony storyline (out of six) is already complete and the game is progressing quickly. If the game generates enough interest, expansions will include the princesses and many of the background ponies. To keep up to date with the progress of Somepony Has a Crush On You, follow The Southern Nerd on Facebook, Pinterest or Patreon. Previous Want to be Featured on The Southern Nerd?